I must begin by listing two distinct disadvantages I have when discussing that peculiar mix of cajun & creole influences that we call New Orleans cuisine. First, my last and only visit to New Orleans predates the Clinton Administration, so to say I'm unfamiliar with the contexts of the cuisine's terrior would be an understatement. Still, I know enough to tell a beignet from a bagel. Secondly (but most importantly), I am allergic to shellfish, which knocks out about half of a given New Orleans menu (and, arguably, its core dishes). It's a curse, I know. But, for two successive lunches, I have enjoyed the offerings of Lola's, a "Louisiana Kitchen" in the Holsum lofts, that suite of offices & galleries housed in the former home of the historic Holsum Bakery, whose facade still decorates the place just off Charleston & I-15. (I am native enough to remember when it was still a working bakery!) It's a space that has changed hands numerous times over the years, and I've even visited a couple of the previous incarnations, including a luncheon cafe that served a great pork-chop plate. But life goes on. On my first visit to Lola's, I was alone due to scheduling snafu with a buddy of mine. Never one to waste an opportunity, I decided to lunch solo. Lola's is an intimate place, with only a dozen tables in its dining room, as well as a 6-seat bar. It's authentically decorated (as far as I can tell), and, on fair weather days, they set out a few tables on their front patio, giving diners a view of the passing traffic on Charleston Boulevard & the buildings of downtown Las Vegas. Because of my previously-mentioned allergy, I decided to try the chicken wings for my starter, which the waitress promptly warned me "run a little spicy" for most tastes. I also ordered lemonade, which provided the meal's only low point: I was served a glass of syrupy, artificially-flavored, soda-fountain lemonade. My feeling is lemonade is one of the easiest beverages in the world to make, and, contractual obligations to beverage suppliers notwithstanding (for I had noticed the logo on the glasses), the homemade stuff is way more refreshing than the stuff that squirts from a nozzle. And the chicken wings, though tasty (and indeed spicy), were standard fare -- served in a basket with a dish of ranch dressing and a handful of celery slices. It was a dish I could have gotten from a dozen taverns within walking distance of my home. If these wings were distinctly New Orleans in flavor, then I've been eating New Orleans chicken wings every time I get an order with my pitcher of beer at the Inn Zone. So, while not particularly distinctive, Lola's wings were still delicious. My entree, however, was divine. I had ordered the Bronzed Catfish & Grits, which featured pan-blackened pieces of catfish served over gouda-infused grits. The fish were cooked perfectly, with just enough seasoning to complement, rather than overwhelm, the mild flavor of the flaky-yet-moist flesh. And the mushroom & andouille sausage ragout was a lovely, pungent counterpoint to the grits. I devoured all of it. The problem with being a glutton is that once you start, you don't know when to stop. So, of course, even though I'd packed in both a starter & an entree, I followed up with dessert. The bread pudding, a sticky-sweet custardy concoction covered in Rum Praline sauce, was almost too good. It was rich & flavorful, with a firm consistency that still managed to retain its puddingness, and it nearly made up for the artificial lemonade. On my next visit (this time with the friends who were supposed to be with me on the first visit), I tried a taste of the Charbroiled Oysters starter, which was so wonderful that even the Princess took a bite. Broiled in-shell and covered with cheeses & garlic, this appetizer did not last long enough for me to get a picture of it. And, thankfully, though my tongue did tingle a bit, I didn't go into anaphylactic shock. For my entree this time, I ordered "Mama's Red Beans & Rice," which was delicious, though a little tame in the spice department, but this was easily addressed with a few splashes of pepper sauce. It was such a perfect portion of New Orleans comfort food, that, despite my inner glutton, I decided against another dessert, although I barely resisted the siren song of the Sweet Potato Pecan Pie. The Princess did get a dish of Butter Pecan ice cream, which she generously shared. 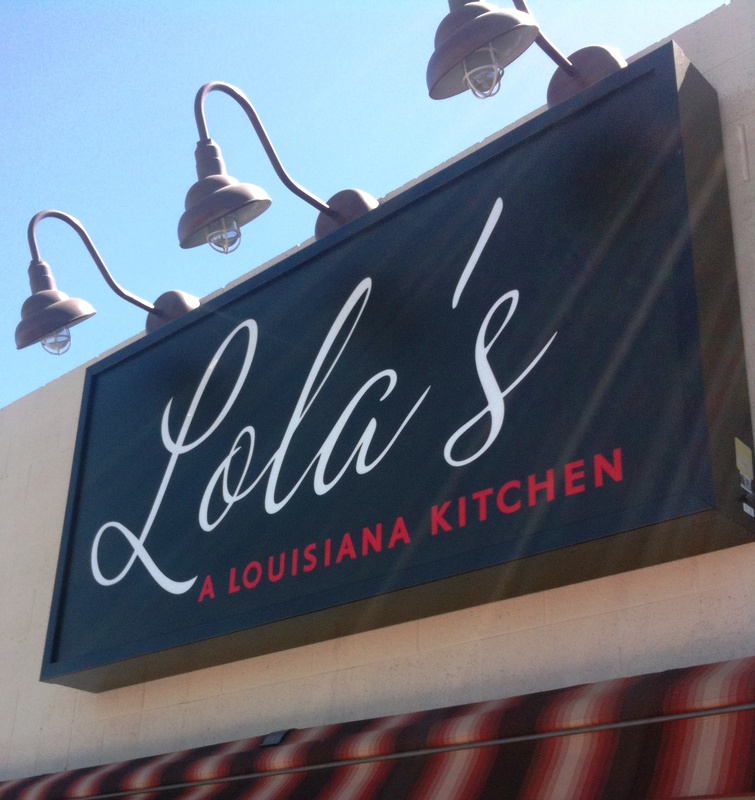 The service at Lola's is excellent & cheerful, and everyone seemed knowledgeable about the offerings. On my first visit, I listened as Lola herself warmly conversed with a young couple who had originally stopped in for a takeout order but ended up making tentative plans for their impending wedding reception. Now that's being a hostess! I have to recommend Lola's to anyone looking for a good local eatery as opposed to the anodyne chain restaurants that plague our landscape, choking off any indigenous establishments. Lola's has character; it offers an array of interesting dishes, and it deserves to succeed. Plus, local food-god John Curtas, ever my guru in all things gastronomic, agrees with this assessment in his own review. I plan to return to Lola's. Soon. As always, the bread pudding, a sticky-sweet custardy concoction covered in Rum Pralines sauce is really a delicious one for me.